One in three millennials in a relationship spy on their significant other’s texts every week without their permission. Your significant other (SO) goes out of the room for a few minutes leaving their biggest treasure of personal information behind. Their phone, sitting there and buzzing with incoming notifications, is just so tempting. What’s the harm you think if you just take a peak on some of the notifications? After all, there are no secrets in your relationship. If you don’t already have their password (about 76% of Americans share their passwords with their SOs), you’ve probably side-eyed them in a covert mode and noted their password. Are you going to find a wealth of spicy texts from a secret lover or an obsessed ex? Your desire to know it is killing you. According to a recent YouGov survey (July 2017), about one in four Americans in a relationship searches their SO’s texts every week without their permission. This number drops to 15% of all people who go through their SO’s phone EVERYDAY, but 24% of millennials do this daily. 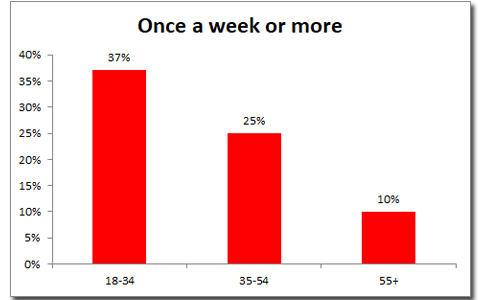 A more startling trend is that 37% of millennials who are in a relationship snoop once a week or more. Ciao Digital Privacy - % of Americans who are in a relationship and snoop on their SO’s text messages. Of course, it doesn’t stop at text messages/SMS. Once inside the unlocked phone, you have full access to all of their emails, social media posts and instant messages. Millennials take full advantage of this unfettered access and over a third of them expand their search into social media and emails. This extension beyond text messages just crossed into stalking behaviour. Whereas millennials lead the pack with snooping, about a quarter of Generation X (adults aged 35-54) in a relationship spy on their SO’s texts, social media and emails. 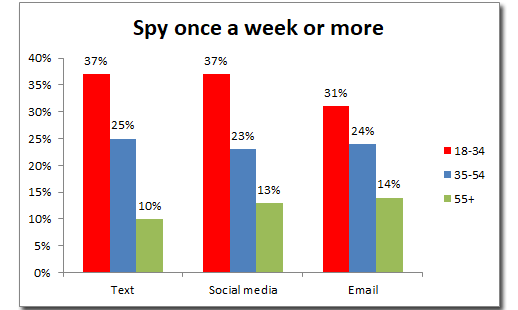 Looking at the trend that as you get older, you are less likely to spy on your SO’s phones. How does this compare to people’s marital status? 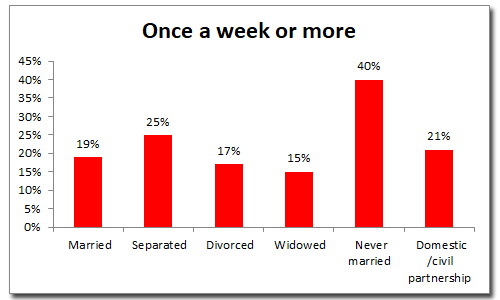 40% of never married people spy on their SO’s phones compared to 19% of married people. Never married people show less respect for privacy - % of Americans and the type of relationship who snoop on their SO’s text messages once a week or more. What started off as simple curiosity and a harmless peak at what your SO is upto, will often lead to pain for all parties. When you go looking through someone’s private messages, if you look hard enough, you will always find something to be upset about. If you suspect that you SO is cheating, all therapists will tell you that it is better to talk and confront them instead of invading their privacy. After all, in a healthy relationship, both partners should trust each other unconditionally, and respect each other’s right to privacy, personal space, having a life that extends past the relationship, etc. In many countries, it is also illegal to snoop through your partner’s personal emails, texts, password-protected smartphone or Facebook page. You can do a google search, but nothing more. See this article of a Swiss woman who was fined for snooping into her unfaithful husband’s emails. There’s a scary term when someone conducts a forensic type search – digital strip search. This is not only a violation of privacy, but it is degrading and humiliating. Let’s just respect others’ privacy the same way we want ours protected. For more info and detailed stats, visit YouGov.